Fortnite always makes sure that its players never get bored playing the same thing over and over again and thus have weekly challenges that make the game for fun and objectives makes the gamers return to the game as they have newer perspectives, challenges and a goal to complete each week. Thus Epic Games currently enjoy a majority of online gamers as they themselves are invested into the game as much as the players. 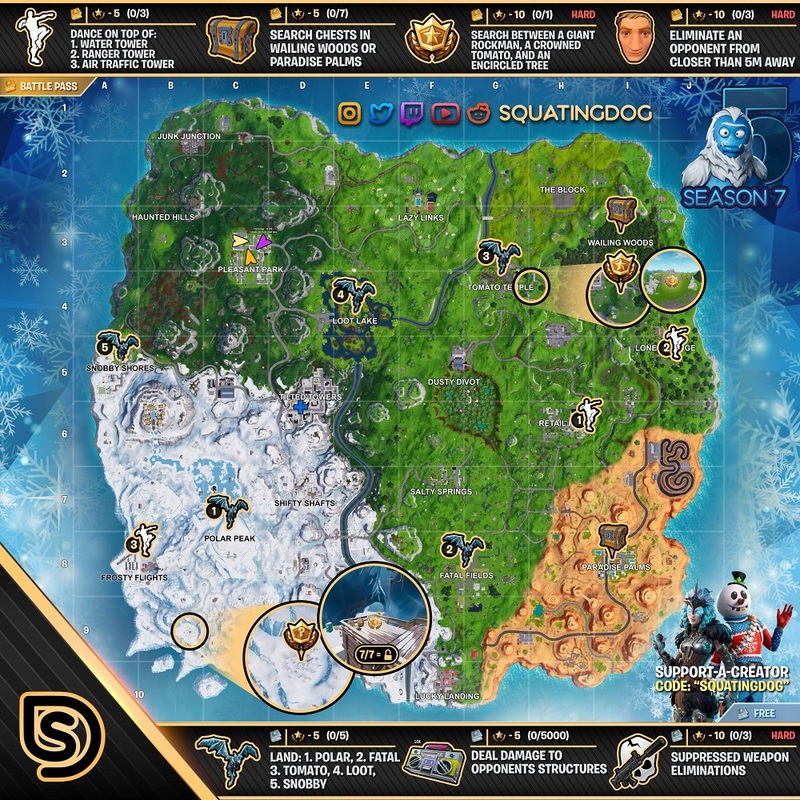 Now before you rush into the game and get overwhelmed by it, you should probably go through this cheat sheet provided by reddit user u/squatingdog. This week you will need to shake your body as a part of 3 part challenge, you’ll need to dance on top of Water Tower, Ranger Tower and Air Traffic Tower. Going ahead you will need to search for chests in Wailing Woods and Paradise Palms, the search between a Giant Rock Man, a Crowned Tomato and an Encircled Tree is cryptic but familiar to regular players. You’re looking for a spot between these three features. Head to the Tomato Temple to find this location. The achievement is unlocked by heading to a point between these three locations and look for a dirt patch to the south of the covered bridge connecting the two hills of Tomato Town. You will also have to get up close in this week’s challenge to eliminate someone, so be extra careful when sneaking up on someone or you can just hack someone with your trusty battle axe just as the game begins. Fortnite Battle Royale is available now on PS4, Xbox One, PC, Nintendo Switch, and Smartphones. It was developed and published by Epic Games. Check our other Fortnite Season 7 Guides, Cheats and More.